5:10 PM-Radio station 640 WGST reported that Danzig gnawed through the bars of his cage and ran through a crowd of terrified onlookers on his way to the Dippin’ Dots stand. He knocked the stand over and began to howl in a bluesy voice about how ice cream used to mean something. 5:20 PM-CBS News reported Danzig was surrounded by police. Desperate and frightened, Danzig took a three-foot marmoset hostage at gunpoint. 5:47 PM-ABC News reported that Danzig threw the marmoset at police officers. The marmoset exploded into giant ball of light temporarily blinding the officers and allowing Danzig to escape the park. 6:08 PM-Several witnesses claimed Danzig ripped his shirt off and stole a broken down 1995 charcoal grey Ford Focus with a “Who Is John Galt?” sticker on the bumper. 6:09 PM-CNN reported that the Ford broke down and Danzig was left to escape on foot. 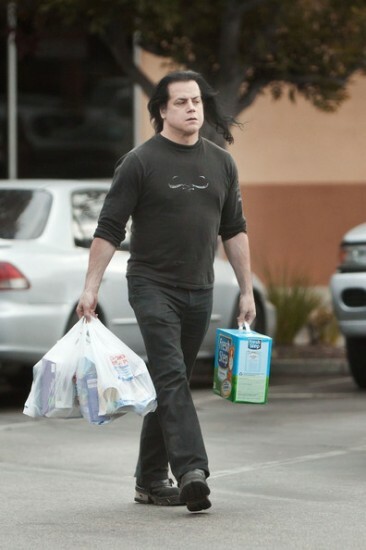 6:16 PM-Witnesses spotted Danzig in a BP station stealing boxes of beef jerky while bellowing the lyrics to “Sistinas”. 6:25 PM-Danzig stated unequivocally that there will be no Misfits reunion. 7:26 PM-Fox News reported that MARTA cameras identified a well-built, naked man fitting Danzig’s description running through the Vine City station. Fox anchor Brit Hume went on to conclude from the footage that it is clear that Danzig is a Muslim terrorist. 7:34 PM-Fox retracted the earlier MARTA story and confirmed that the naked man was former Georgia Governor Sonny Perdue. However, they continued to claim Danzig is affiliated with Al Queda. 7:46 PM-CNN reported a SWAT team has surrounded a Waffle House in Downtown Decatur and that Danzig was eating a plate of hash browns and talking to the waiter about the occult roots of Nazism. 7:58 PM-A SWAT team stormed the Waffle House and arrested the suspect. 8:09 PM-CNN reported that the man in police custody is actually Arnold Horseschaker, a Danzig impersonator who had, hours earlier, played a 5-year-old’s birthday party in Alpharetta. 10:38 PM-AP reported that Danzig was spotted on a Vincent Blackshadow motorcycle riding up I-85 at speeds of up to 120 miles per hour, his hair gently cascading in the wind. 10:43 PM- According to AP, Danzig’s flaming motorcycle leapt over 25 police cars while flipping multiple times through the air. He escaped again, unharmed. 10:56 PM-AP changed its earlier story and claimed only that Danzig was photographed on a motorcycle in 1985. 11:07 PM-Danzig’s apartment on Stewart Avenue in Hapeville was raided. Several highlighted copies of Catcher in The Rye were found along with 45 fishnet shirts. 11:13 PM-According to Fox News, a man fitting Danzig’s description was arrested in Osaka, Japan. The man was carrying a copy of the Koran, 5,000 pounds of plastic explosives and Bill Ayers autobiography. Fox announced it is a “100 percent certainty” that the man arrested is Danzig. 11:17 PM-Fox News announced the capture of Danzig in a bar in Tupelo, Mississippi. He was carrying a small nuclear bomb in a suitcase, reading out loud from a copy of Das Kapital and wearing an Obama for President tee shirt. 11:19 PM-The Drudge Report announced that Danzig is actually a Kenyan national named Hussein Abdul-Jihad. 11:38 PM-Various media outlets reported that Danzig and an unnamed accomplice, Glenn Doe Number Two as he’s referred to, were seen breaking into an exotic pet store in Marietta in order to liberate all the pythons, ferrets and tropical fish. The two quickly left the store with several animals and were chased by police. 11:54 PM-WSB-TV in Atlanta reported that police have shot a suspect fitting Danzig’s description only feet away from the Chattahoochee River. The man, who authorities are referring to as “the guy who probably isn’t Danzig but looks slightly like him”, was attempting to throw a bag of tropical fish into the water. 12:01 AM-CNN reports the man shot by the Chattahoochee River was actually Ron Ziegler, former Press Secretary to President Richard Nixon. 12:05-4:30 AM-Most media outlets, realizing the audience was quickly losing focus, began to speculate on the nuclear capabilities of North Korea and the possibility of the Ebola virus being spread through Wendy’s hamburgers. 4:33AM-CNN reported Danzig was captured only feet away from his cage at the Atlanta Zoo. He had been hiding behind a tree.